Apple's new iTunes online music store has continued its run-away success, with more than two million songs downloaded within its first 16 days. The online store has more than 200,000 songs for sale, costing 99 cents each. Worries in the record industry that customers would cherry-pick hit songs have not come true, with more than half of all songs purchased as part of full album downloads. However, there are indications of first cracks in the revenue model. Some Macintosh users have reportedly begun to circumvent Apple's copy-protection software and began to swap songs online - without paying. A Windows version of iTunes is planned for later this year, and an overseas expansion is on the cards as well. The iTunes web site allows customers to listen to brief snippets of songs before deciding whether to buy them. 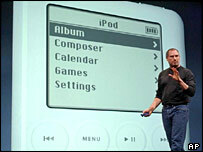 By clicking a button the music is downloaded to their computer and can then be "burned" on CDs, copied to up to three other Macintoshs, or transferred to digital music players like Apple's popular iPod. Apple's online music store is the first of its kind that shows any clear commercial success. Most record companies have tried in some shape or another, but failed to attract customers in large numbers. Getting music online was popularised by file-swapping service Napster, which is now-defunct. It allowed Napster users to swap songs with each other, but without paying any royalties to artists or record companies. Napster was taken to court and shut down, because its service was based on a central registry of available files held on Napster's computers. Other file-swapping services like Kazaa and Morpheus use different decentralised technologies that allows users to track down and download music, and have so far escaped any legal sanctions. But analysts and music executives now report the emergence of web sites and software that enables Macintosh users to make unauthorised copies of songs downloaded from iTunes. Industry executives interviewed by Reuters news agency say that so far Apple's success outweighs the services problems, although one was quoted as saying that "no solution is bullet-proof".